1 boneless center cut pork loin roast, about 3 lbs. In a large ovenproof saucepot or Dutch oven over medium high heat, cook bacon for 3 to 4 minutes, or until lightly crisp. Season pork with salt and pepper if desired. Brown pork on all sides for 3 to 4 minutes, turning occasionally. Add onion, carrots, celery and rosemary, and cook for 6 to 8 minutes, stirring frequently. Add milk and bring to a boil. Cover saucepot and place in oven for 60 to 70 minutes, or until internal temperature of pork reaches 155 degrees F, turning pork occasionally. Remove from oven and transfer pork to cutting board. Allow to rest for 5 to 10 minutes before slicing. Discard rosemary stems. Place 1/2 of vegetable mixture in a blender or food processor, and process until smooth. Return to saucepot and bring to a boil over medium heat. Stir in Pasta Sauce and simmer for 8 to 10 minutes, stirring occasionally. 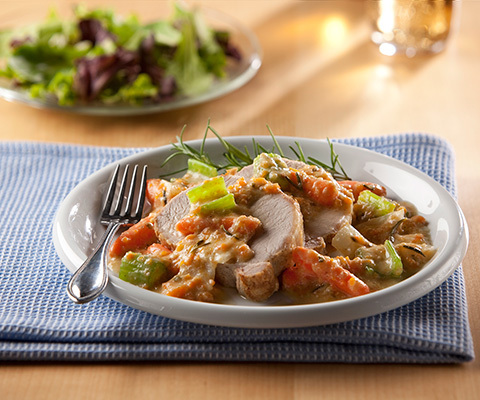 Serve warm with sliced pork roast. If desired, substitute Classico® Creamy Alfredo Pasta Sauce with Classico® Light Creamy Alfredo Pasta Sauce.